This letter was written by Lt. Benjamin Wright (1834-1913) of Co. I, 10th Connecticut. He was from Greenwich, Connecticut. 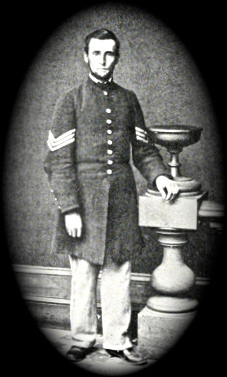 Wright was mustered in September 1861 as sergeant. Promoted to 2nd Lieut. January 8, 1863; 1st Lieut. June 6, 1864; and mustered out 17 October 1864. Wright saw action with the 10th Connecticut at New Bern, the assault on Fort Wagner, 1863 Charleston campaign, Bermuda Hundred, and Petersburg. In this letter written from St. Helena Island in South Carolina, Wright describes two expeditions of the regiment and, in particular, the heavy losses sustained by the 10th Connecticut in the Battle of Kingston [or Kinston] — an engagement overshadowed by the much bloodier Battle of Fredericksburg that was taking place at the same time in Virginia. Two soldiers of Company I who were killed in the battle at Kingston were singled out in this letter by Lt. Wright for their bravery — Corporal John Wallace, the color bearer, and Pvt. John Hubbard, both from Greenwich. Wallace was mortally wounded by a shot to the head and Hubbard died following the amputation of his leg just above the ankle. Greenwich citizens were particularly well represented in the 10th Connecticut Volunteers. Company I, of the 10th regiment consisted entirely of Greenwich men. The company’s first commander was Major Daniel Merritt Mead. Major Mead lead the first contingent of Greenwich volunteers into the Union ranks; approximately fifty five young men, averaging 21 years in age. In the ranks of Company I were twelve pairs of brothers, three pairs of brothers-in-law as well as three pairs of father and son serving together. The final page of the letter is missing so there is no signature and there is no accompanying envelope to aid in the identification of the man to who Lt. Wright addressed this letter, though it is believed he was from Greenwich. There were several members of the Husted family living in Greenwich at the time and they seem to have been connected to the Brush family with whom Benjamin Wright was associated. If my recollections serve me, I have for a long while indebted to you for a letter. I usually try to be prompt in answering my letters but you know the circumstances. Just after I received your letter last summer, I came home. After I returned to my regiment, some way or other it slipped my mind until I had become an old story and my time was very much occupied. It has thus run along until now. There is no time like the present. I have decided to set to work immediately and make up for my negligence. Since my return from home, our life has been more active than ever before since we entered the service. On reaching New Bern, I was promoted to orderly. Immediately the duties of that office — particularly when in active service — are very many and occupies most of a man’s time. I remained in that position until the 7th of January when I was promoted to be 2nd Lieutenant, Co. A. Since then my duties have been much lighter although they are heavier than would be if we had a 1st Lieutenant with us. We have one, but he is on Gen. Ferry’s staff. Then the Captain does not go out with the company but little. He has been away now for three days. I expected him back this morning but he has not made his appearance yet. He is expecting a commission as Major of the regiment. Soon after I returned, we went on what we called the Tarboro Expedition. We did not go to Tarboro. We went to within about nine miles of there. We went to Williamston and Hamilton and back by the way of Plymouth. We were gone fourteen days — marched something like two hundred miles and by water something over three hundred. We had but one fight and that at night. Give me any other time but night to fight. It is bad enough at anytime, but more particular then. You can’t tell what you are getting into. We lost no men, however. Part of the march I did in my stocking feet — my feet becoming so sore that I could not wear my boots. We had quite a heavy snowstorm while we were gone. I will now take my pen in hand and communicate to you the news of the day. It is about the hard battle of Dec. 14. Our intentions were to destroy the railroad between Goldsborough and Charleston which we done. But not without some hard fighting, and loss of life. We had a small skirmish, we killed 5 Rebs wounded 4 and took 7 prisoners. The next day when within 3 miles of Kingston we met them in force… We went in front and engaged their center. They was in the open field and we hid in a thick swamp. We came out with charge of the bayonet and drove them from their position… We had to lay down to load and raise up to fire. I fired 32 rounds taking good aim. There was 3 men killed within 4 feet of me, one of them fell on me when he was shot…I will not tell on the particulars of this for we had two more hard fights before we got to our journeys end. One at Whitehall the other at Thompson’s bridge. We whipped them at both places with heavy loss… General Foster gave us a speech and said we be counted with the bravest of the brave here after. This entry was posted on Saturday, June 21st, 2014 at 12:37 pm	and posted in Uncategorized. You can follow any responses to this entry through the RSS 2.0 feed. The Letters of George W. Scott, Co. I, 46th Massachusetts | Hunting rebels as a dog would a fox….